Press Release | Applikon Biotechnology B.V.
Delft, The Netherlands: – Dutch-based upstream bioprocess equipment specialist Applikon Biotechnology B.V. (Applikon) is providing bioreactor technology to support one of the most significant environmental and sustainability initiatives yet launched. Meatable (Leiden, The Netherlands) initiated the CLEANMEAT project in which the world’s first scalable method for production of cell-based meat is being developed. 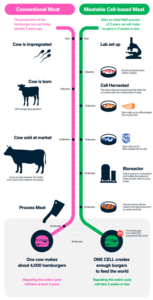 By using breakthrough patented single-cell technology, Meatable aims to ‘Feed the World with a single cell’. Applikon (Delft, The Netherlands) is partner in this CLEANMEAT project and provides advanced bioreactor systems and technologies that enable cultivation of the cells. The scaffold to provide texture to the meat is being delivered by CLEANMEAT project partner Noviocell (Oss, The Netherlands). Over-reliance on agriculturally reared meats has been identified as one of the major problems in achieving a sustainable world. Livestock farming is a major contributor to greenhouse gas emissions, a highly inefficient use of land and also a major factor in the destruction of forests and natural habitats. Cell-based meat production has an estimated potential to reduce water consumption, agricultural land usage and greenhouse gas emissions by up to 90%, compared to conventional meat production. Meatable’s mission is to produce better meats that benefit the world, starting with a single cell. Cell-based meat is no longer science fiction, but the culmination of breakthrough stem cell technologies and a game-changing patent created by scientists from Cambridge and Stanford universities. “We are very happy to be involved in this supremely important project as it is fully in line with our mission to provide reliable solutions to the bioprocess market that will enable an improved quality of life,” said Timo Walvoort, Head of Product Development at Applikon. 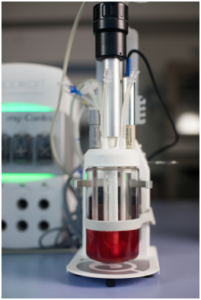 “Providing the Meatable team our single-use stirred tank bioreactor AppliFlex ST and related technologies to cultivate the necessary iPSCs (stem cells) to high cell densities, makes us very proud” he added. “We are part of a true revolution in the meat industry”. The unique Meatable process is able to take one cell from a cow, chicken, or pig to create both animal muscle cell AND fat cells that grow into clean, healthy, tasty meat for human consumption. This proprietary approach uses minimal resources to produce meat in just three weeks. The technology can be applied to produce chicken, pork, and beef, which account for 90% of total global meat consumption. Unlike conventional meat or other cell-based meat products, no animals are harmed during the cell harvesting process and no additional animal support is needed after the cells are collected. Solving the problem of scalability in the cell-based meat market is critical, and Meatable is poised to tackle that challenge head on with one cell. Bioreactors thus play a key role in growing the right cells and producing enough for a juicy burger. Backed by additional funds obtained from divers investors, like the local province of Zuid-Holland, the CLEANMEAT project team is moving towards rollout aiming to present its first product within three years. Netherlands-based Applikon Biotechnology B.V. (Applikon) is a manufacturer that specializes in upstream bioprocess equipment for the life sciences industries. Its mission is to provide reliable solutions for the bioprocess market to enable improved quality of life. Applikon’s core business is in the development and supply of advanced bioreactor systems from laboratory scale, to pilot, to production scale, partnering with customers to implement scalable platforms from initial screening through development and full-scale production for a global client base that includes pharma and biotech companies, food industry, CROs, CMOs, governmental and academic organizations. Applikon designs, develops and assembles bioreactor systems, with all design and manufacturing conducted in-house. The Applikon portfolio covers key product and service areas including bioreactor cultivation systems, BioBundle turnkey systems, the unique BioSep Acoustic Perfusion System cell retention device, process control systems to automate bioprocesses and a range of proprietary Applisens sensors, and automation (monitoring and data management) solutions. Apart from its standard cultivation and turnkey systems, Applikon also offers Special Projects: custom solutions aimed at helping clients fulfil strategic needs such as long-term development, capability expansion and upscaling. Media Department, Applikon Biotechnology B.V.
Click on Applikon technology support Meatable project for more information. Click on Applikon Biotechnology B.V. to contact the company directly. Click on Meatable to find out more about the project.